The Photomerge Panorama command enables you to combine multiple images into a single panoramic image. From skylines to mountain ranges, you can take several overlapping shots and stitch them together into one. To be successful at merging photos into a panorama, you need to start with good source files. First of all, make sure that when you shoot your photos, you overlap your individual images by 15 to 40 percent, but no more than 50 percent. Then, avoid using distortion lenses (such as fish-eye) and your camera’s zoom setting. Also, try to keep the same exposure settings for even lighting. Lastly, try to stay in the same position and keep your camera at the same level for each photo. If possible, using a tripod and moving both the tripod and camera along a level surface, taking the photos from the same distance and angle is best. However, if conditions don’t allow for this, using a tripod and just rotating the head is the next best method. All Photomerge commands can be accessed in all three Edit Modes or in the Organizer. Choose File→New→Photomerge Panorama in Edit Full mode. The first Photomerge dialog box opens. 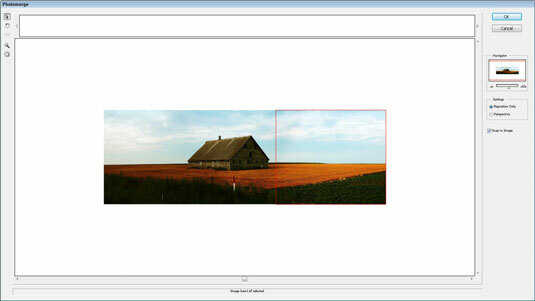 The initial Photomerge dialog box. Select Files or Folder from the Use drop-down menu. Click Add Open Files to use all open files, or click the Browse button and navigate to where your files or folder are located. Choose your desired mode under Layout. Auto: Elements analyzes your images. Perspective: If you shot your images with perspective or at extreme angles, this is your mode. Also, try this mode if you shot your images with a tripod and rotating head. Cylindrical: If you shot your images with a wide-angle lens or you have those 360-degree, full panoramic shots, this is a good mode. Reposition: Elements doesn’t take any distortion into account; it simply scans the images and positions them best. If you choose any of the preceding modes, Elements opens and automatically assembles the source files to create the composite panorama in the work area of the dialog box. If it looks good, skip to Step 7. Elements alerts you if it can’t automatically composite your source files. You then have to assemble the images manually. Interactive Layout: This option opens the work area pane. Elements tries to align and stitch the images the best it can, but you may have to manually complete or adjust the panorama. 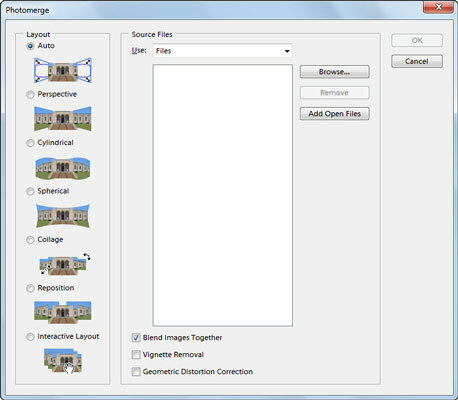 Combine multiple images into a single panorama with Photomerge. Note that with any of the modes, Elements leaves your merged image in layers. You’ll also notice that a layer mask has been added to each layer to better blend your panoramic image. If Elements hasn’t already, drag the image thumbnails from the lightbox area (the small white area at the top) onto the work area with the Select Image tool (the arrow). Or you can simply double-click the lightbox thumbnail to add it to the composition. Select Image tool: Positions the images. Rotate Image tool: Makes rotations. Zoom and Move View tools: Helps view and navigate around your panorama. Navigator view box: Zooms into and out of your composition when you drag the slider. Snap to Image option: Enables overlapping images to automatically snap into place. To adjust the Vanishing Point, first select the Perspective option in the Settings area and click your desired image with the Set Vanishing Point tool. Elements changes the perspective of the composition. By default, Elements selects the center image as the vanishing point. If necessary, you can move the other images. Note that when you select the Perspective setting, Elements links non-Vanishing Point images to the Vanishing Point image. To break the link, click the Normal Setting button or separate the images in the work area. Click OK to create the panorama. The file opens as a new, unsaved file in Elements. Note that you can also click the Save Composition button to save the file as a Photomerge Composition (.pmg) file. You may want to avoid this, however, because the file format isn’t very compatibility friendly.